The directive issued by the Indigenous People of Biafra, IPOB, for all the residents of the South East states to sit at home yesterday in protest against last year’s invasion of the home of its leader, Mazi Nnamdi Kanu, as well as the alleged killing of many pro-Biafra agitators and the recent detention of many women in Imo State, turned violent in Rivers state as 15 trucks were set ablaze while four drivers were abducted by IPOB members. The police however said 19 members of the group have been arrested even as the sit-at-home order witnessed partial success. The IPOB leadership on its part claimed that the order recorded 70% compliance in most states in the Eastern part of the country. In Rivers State, the Police Command said it apprehended 19 members of the Indigenous People of Biafra, IPOB, over their alleged involvement in setting ablaze 15 trucks at Oyibo Local Government Area of the state even as the sit-at-home order of the IPOB experienced total failure in the state. The Public Relations Officer of the state police command, DSP Nnamdi Omoni, disclosed to Saturday Vanguard that 19 persons suspected to be mastermind of the act have been arrested, adding that four trucks were burnt. Omoni said: “Our men based on intelligence report were there on time to arrest the situation. The IPOB members destroyed many valuables. As I speak the police have arrested 19 of them and they have confessed to the crime and we are after others who are now at large. We are not aware of any abduction now, but investigation is on. Arsonists, believed to be ardent supporters of the IPOB had in the early hours of Friday gone on rampage and burnt down over 15 trucks conveying different goods; baking flour, fertilizers, Noodles, beans, and other items out of Rivers State. The IPOB members were alleged to have abducted four drivers of the trucks they attacked. One of the victims, who is the Secretary of the National Union of Road Transport Workers, Notore/Indorama Trailer Park, Onne branch, Mahmud Lawal, alleged that four of the drivers were kidnapped. He said: “We were informed that it was IPOB members who set our trucks ablaze. Some of the trucks set ablaze were conveying goods outside Port Harcourt, others were parked along Port Harcourt/Aba express road by Oyigbo Timber junction. Some other ones were coming into Port Harcourt through Oyigbo. “The trucks were loaded with 30 tons of beans, 30 tons of fertilizers, 30 tons of rice and were on their way to their various destinations before they were attacked. Another victim, a truck conductor, Ahmed Musa, disclosed that the bandits accosted them at about 3.00am, and beat them up thoroughly before setting the trucks ablaze. Musa also claimed that some drivers were abducted saying that their whereabouts were still unknown. However, the Chairman of Oyigbo LGA, Mr Gerald Oforji, said that he was informed that some bandits were attacking residents of the area and threatened them not to open their shops and business centres. Oforji confirmed that some trucks conveying goods and compactor machines were set ablaze by the arsonists. In Anambra state, apart from Nkpor area and the commercial city of Onitsha where the sit-at-home order was totally observed, apparently because the group threatened the residents, which made the people to stay indoors, the order failed in Awka and the rural areas as most businesses and offices were open. All public schools and some missionary schools in Anambra State were open, although many parents did not take their children to school for fear of the unknown. Shops in the popular Nkwo Nnewi market were under lock and keys, although the entrance gates to the market were open, while some of the traders were seen sitting in groups around their stalls. Most of the banks were closed while few opened but later closed when it dawned on them that market traders were not ready for business, just as some school children who went to school early morning later returned home when they discovered that the schools did not open. However, a combined team of the Police, Army, Directorate of State Services, DSS, Nigerian Security and Civil Defence Corps and local vigilance groups were busy patrolling round Nnewi community. Street traders were no were to be found as shops were seen under locks and key. The usual human movement was scanty in the town, while few vehicular movements were those of Police convoy, or those trailing security patrol vehicles to get to their destinations. Commercial buses were also off the streets and roads in Nnewi. Security operatives were stationed at strategic places and people went about their businesses. Some filling stations did not open, but all NNPC stations and few other stations operated in all the major towns in the state. The Anambra State police command, after observing the situation in the state, said the compliance was near total failure because the people had confidence in the ability of the police to protect them from harassment and intimidation. In Enugu state, both commercial and secular activities were in full swing as residents failed to comply with the sit-at-home order. Streets of Abakpa-Nike, Enugu metropolis were beehive of activities with commercial and private vehicles heading to different destinations. Petty traders and hawkers also took their strategic positions on the the streets to sell their wares while newspaper vending stalls were crowded with young men who engaged in arguments over the compliance with the IPoB directive. Mass transit parks such as Nsukka and Abakaliki were equally busy taking passengers to different destinations. In the hinterlands such as in Ugwogo community, the usual village settings remained even as police check points were also maintained along Ugwogo-Nsukka road. Some shops were however closed in Enugu metropolis but banks were opened attending to customers. Areas monitored were Agbani Road, Zik Avenue, Mgbemena Road, Ogbete Road as well as state’s Secretariat Complex, Ogbete Main Market and New Market, Enugu. Mr Chris Ugwu, a commercial tricycle operator in Enugu, said he started business for the day as early as 6 am saying that the areas he had taken his customers to had been peaceful and calm. A trader in Ogbete Main Market, Mr Mike Nnam, said that the sit-at-home had no effect at all as nearly all traders had opened their shops for business. A welder along Zik Avenue, Mr Okechukwu Eke, said that he was just hearing about the sit-at-home order yesterday morning from another artisan neighbor, adding that he had already opened for business. Meanwhile, soldiers were seen on red alert as they mounted fresh road blocks in exercise of Operation Phython Dance 3. Police also patrolled the state, giving indication that it was out to deal with any trouble maker. There was non-compliance with the order in Ebonyi state. As early as 6am, commercial activities and vehicular movements had commenced and there were no reported cases of harassment, molestation and victimization of violators of the order. Shops at the popular meat market and other adjourning stores and supermarkets within the metropolis were all booming with commercial activities including banks. Unlike in the past where banking operations were affected, all the banks within Abakaliki were open to customers. Security personnel including the army and the police were seen patrolling the state capital to ensure the safety of lives and property of the residents. Vanguard gathered that the presence of security personnel allayed fears of any possible attacks on the residents by some unscrupulous elements within IPOB in the state. Apart from commercial activities, government ministries and establishments opened for work even as public and private schools were also opened to students who were seen going to school as at 7am. Similarly, in Abia, the sit-at-home was ignored as business and other social activities went on undisturbed. In Umuahia the state capital, banks and other businesses opened while commercial drivers went about their businesses. However, tricycle operators did not commence operation early as they waited to assess the situation before they came out to the streets to begin operations. However, in Aba, commercial activities were halted as traders and other business men closed their shops in compliance with the sit at home protest. Banks shut their doors as customers only made use of the Automated Teller Machines, ATM, around the city. Suspected members of the group had yesterday, gone round markets in Aba, warning traders to stay away from the markets, even the Police and sister security agencies embarked on a show of force exercise around the city. The gates of the markets in the city such as the Ariaria International, Ekeoha shopping centre, Cemetery, Ngwa road, Ohabiam Electronics and the Ehere modern, were open, but shops were still under lock and key. Unlike past protests, no member of IPOB was seen on the streets. Media and Publicity secretary of IPOB, Comrade Emma Powerful, told Saturday Vanguard that there was no attack or arrest of members. Saturday Vanguard gathered that the leadership of the market unions directed the opening of the gates, but traders still stayed away despite the assurance of the Area Commander in Aba, ACP Peter Opara, threatening to arrest any IPOB member found harassing traders at any market. The roads in the city were deserted as people were seen trekking to their destinations with several teams of security agents patrolling the streets while others were stationed at major junctions. However, IPOB leadership, in a statement said it was happy with the outcome of the sit-at-home order. 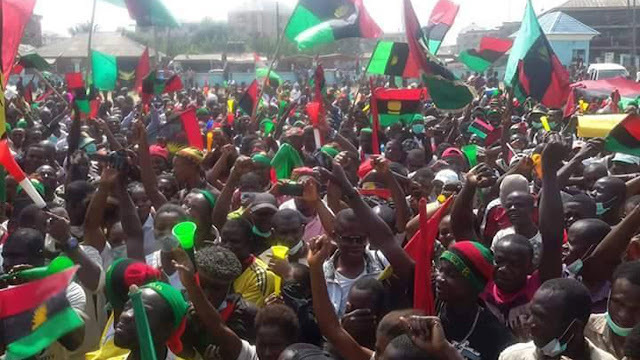 The group’s media and publicity secretary, Comrade Emma Powerful said: “IPOB and its leadership commend the worldwide family of IPOB, all traders unions, market leaders, artisans, teachers, bankers, road transport workers, clergy, business men and women across the length and breadth of Biafraland, for observing a solemn day of remembrance in memory of those that died on 14 September 2017 at Isiama Afaraukwu Umuahia.